I haven’t done one of these in ages, so I am delighted that my newest sponsor is such a fab lady with such a smashing company. Tattoed beauty Spooky Sally runs the world-famous Cherrymuffin Studios in Berlin, Germany. She is someone I’ve been aware of ever since I ventured into the world of pinup, but not someone I ever thought I’d be lucky enough to be in contact with. Her beautifully shot and stunningly well-designed pictures have featured some of the most famous pinup models out there – Sabina Kelley and Anne Lindfjeld among them. People have asked me so many times about how to become a pinup, and how to become a successful pinup, at that. My answer is always the same, that any aspiring model (not just vintage ones!) should put some time, effort, and yes, money into a portfolio shoot. I firmly believe in quality over quantity, and that by investing in a professional shoot with a photographer who knows what she or he is doing, you’re guaranteed to end up with fabulous photos. 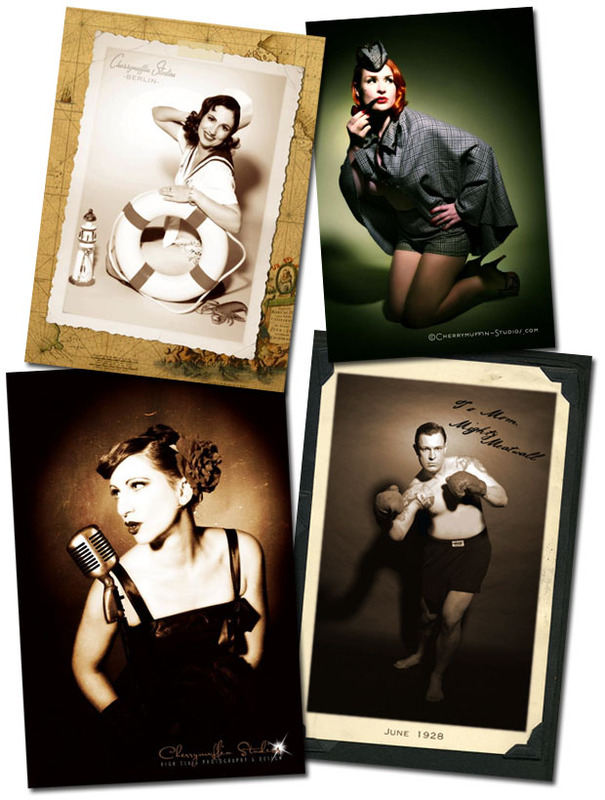 Not just because of the practised skill of knowing how to light and process a pinup photoshoot, but because they will help you pose, keep an eye out for stray bits of hair or lipstick smudges, and capture the angles that make you look like an authentic pinup girl! But, as you can see from the photos, Sally doesn’t just stick to pinup, she’s an expert on capturing both men and women in fabulously Golden Era Hollywood portraits, and turning the results into wonderful pieces of retro design. Her know-how clearly comes as a result of her own passion for vintage style – that’s the gorgeous Sally herself in the bottom two shots above, with her dashing and debonair husband. So please, readers, do take a moment to visit Spooky Sally’s Cherrymuffin Studios site and marvel at her tremendous photography. And if you ever find yourself in Germany, or with the opportunity to work with Sally on her travels, please do look her up! I certainly intend to! She really is AMAZING! She was the first pinup photographer I worked with and I was soo pleased with the result! Her pictures are amazing, and yes, it's well worth investing in a proper shoot or two to build a portfolio! Or just for the fun of doing a shoot and having fab pics at the end of it. Her photos are stunning, i hope that at some point in the future i can be lucky enough to work with her! My faves are the sailor one, the 'horseome' and the very last black/white one- VERY HOT! Oh I would love to be a pin up model my ex boyfriend (now friends) keeps telling me I should be. I'll get some professional shots done soon and see how they turn out. I wish I could go to Germany to get them done! Oh, wow, these are glorious! Oh wow, those are some stunning photos! You are the most beautiful female I have seen for a long time…absolutely wonderful pics!